Kitchen thermometers have become more essential tools now a days. Who want to check the doneness level of meat with fork? Specially, when you have tools available in the market which can not only provide you check the doneness level of your cooking but also monitor your cooking remotely. 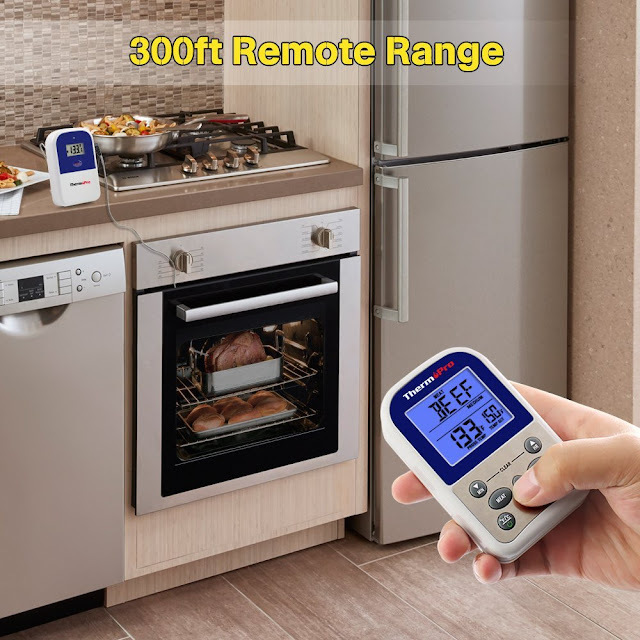 Yes remote thermometer provides you more freedom during your cooking hours. You can watch your favorite TV shows, do other tasks, enhance your productivity and even mingle with your family and friends during cooking hours. Thermopro thermometers available in the market are of various models and there are minor differences in each model with bit of price variation. This is one of the most successful strategy i-Tronics has applied to make their thermopro thermometers successful in the market combined with some other noticeable improvement steps as compared to other manufacturers. 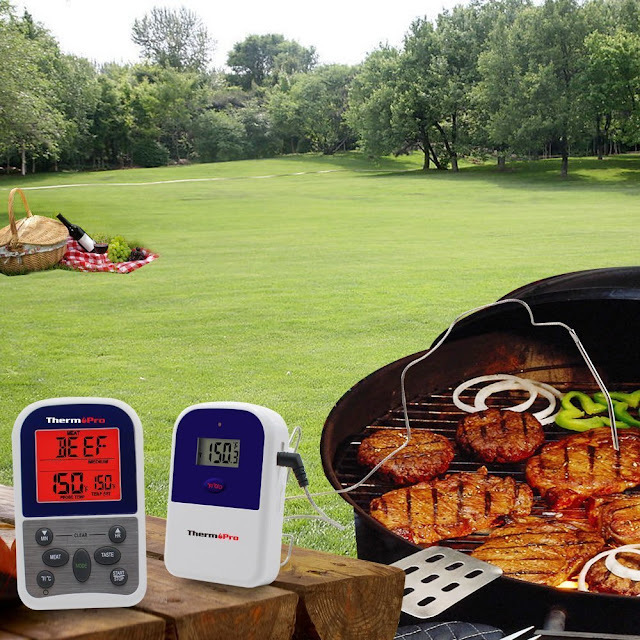 Thermopro tp11 is a remote wireless digital cooking meat food thermometer best for barbecue (BBQ), Grill, Oven and smoker. 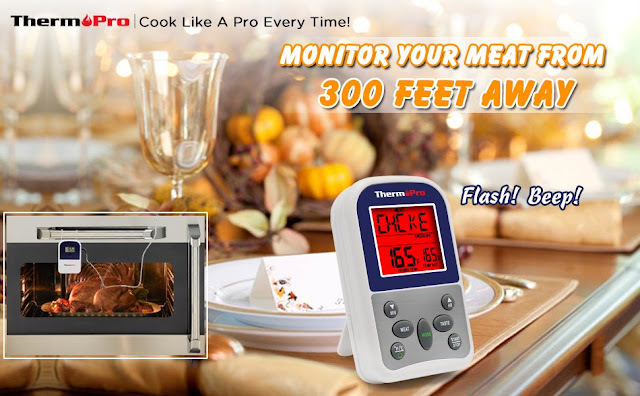 With this Thermopro tp11 thermometer, you have freedom to monitor your food from 300 feet away and it has some unique features with warranty and world class customer support which is must services against our hard earned money. Beside this, USDA approved preset 9 types of meat and poultry temperatures ensures of healthy cooking. But you are not bound to those preset temperatures, you can also set the temperatures manually according to your own favorite taste. When meat reaches your programmed temperature then 300 feet range wireless receiver beeps and flashes. Smart LCD backlit with different colors which changes as your cooking progresses. Preset with USDA approved doneness levels. 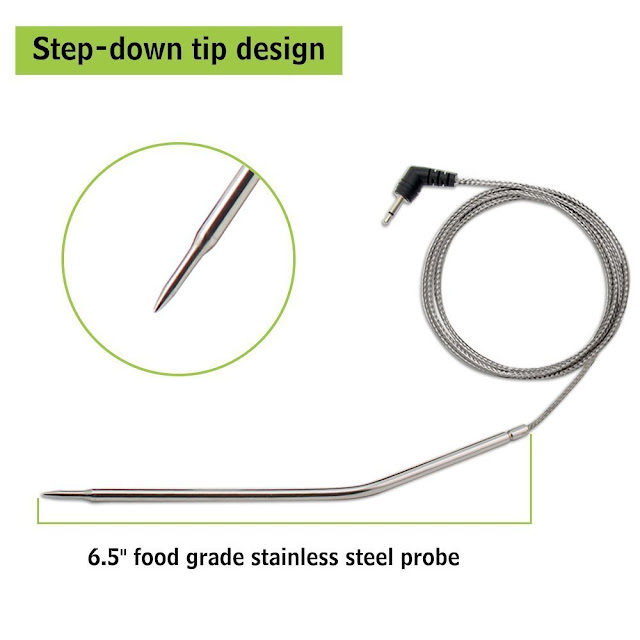 With step down tip design of 4″ stainless steel probe you can get temperature more quickly and precisely. Step Down probe tip design. Receiver’s LCD displays all icons, temperature and timer. Backlight changing colors is one of the top notch kinds of functionality in this thermopro meat thermometer. 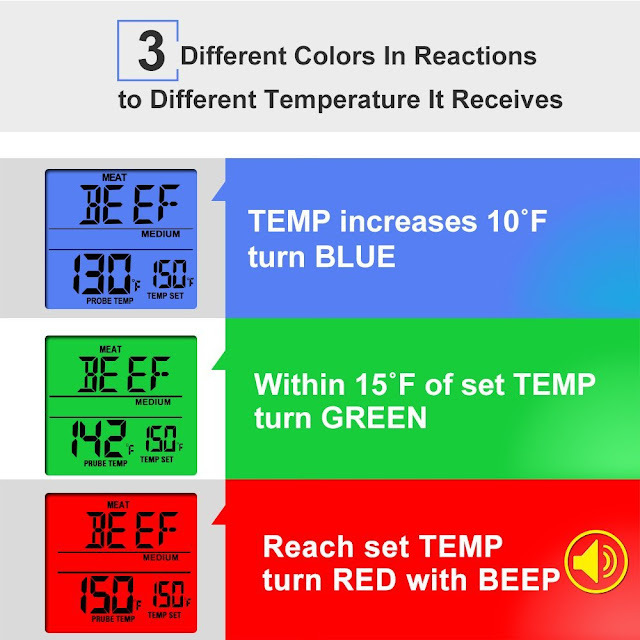 Receiver LCD Color changes as your cooking progresses. When temperature increases by 10 ºF then the backlight will flash blue. And when the temperature of your cooking reaches to your desired configured temperature, the backlight LCD color will turn to red. So, let suppose if you lost while reading or working on your laptop then LCD Changing color will draw your attention automatically towards your cooking. Thermopro tp11 receiver comes with 2 AAA batteries which ensure a reasonable battery backup timing and long hours of cooking. Stand of the receiver of this meat thermometer swings out and allows you to stand the receiver on the tabletop. Thermopro tp11 meat digital wireless remote thermometer required some messy set up and synchronization as well. 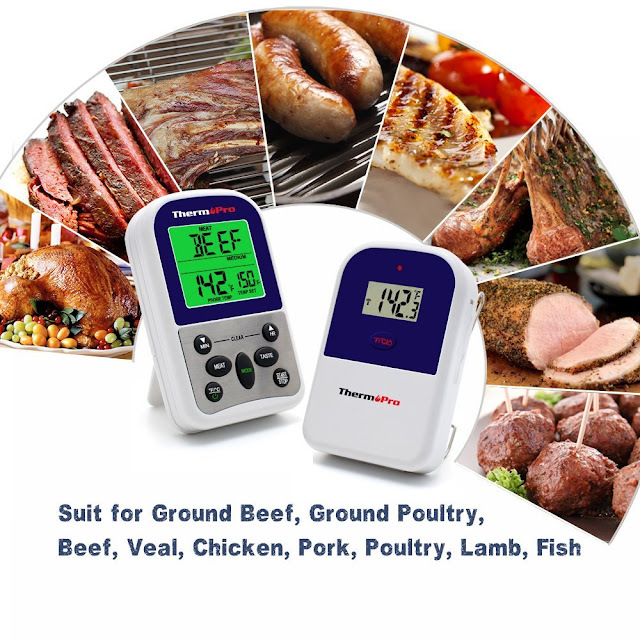 If you are seeking for already synced meat digital thermometers then thermopro tp08, thermopro tp20, thermopro tp07 are best options to go with. 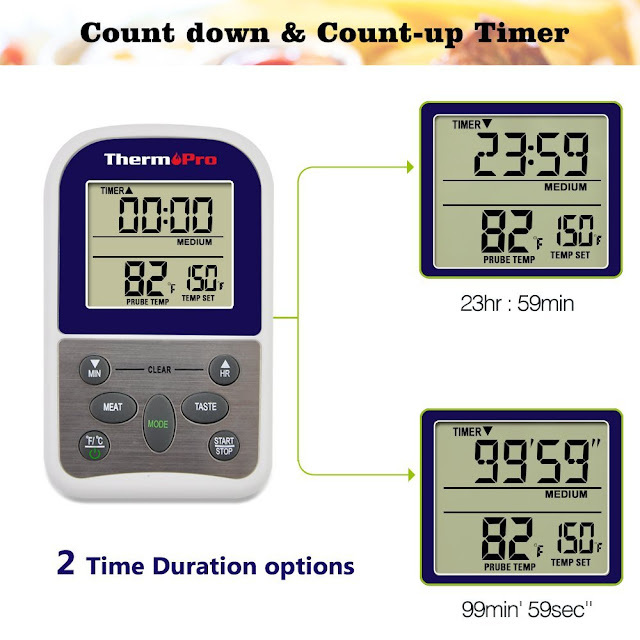 In order to use your thermopro tp11 meat digital wireless thermometer, you have to synchronize them first by pairing transmitter and receiver. Here is a simple method you can follow step by step to synchronize or pair transmitter and receiver. Plug in the stainless steel probe into the transmitter. Insert batteries into the transmitter by opening the battery component. You will see Current temperature on the LCD display and transmitter will now automatically keep sending temperature reading to the receiver of tp11 thermometer for synchronization or pairing. Repeat this step of inserting batteries with receiver by opening the receiver battery component and inserting 2 AAA batteries into the receiver. You will see a flash reception signal on LCD screen. You have to wait for a while until the temperature reading shows on the receiver LCD display. Congrats! Synchronization or pairing is complete. Now your professional remote digital wireless meat food cooking thermometer is ready for use. Note: If in future you have to replace the batteries of transmitter and receiver, then you will have to synchronize transmitter and receiver again otherwise there is no need to pair them again and again. 1) 1 – receiver unit. 2) 1 – transmitter unit. 3) 1 – detachable stainless steel probe sensor. This meat thermometer comes with life time sensor probe warranty. Sensor probe is one of the most important components in food thermometers. Because of improper use or carelessness, after some use, sensor probe may not work properly and may display wrong readings. 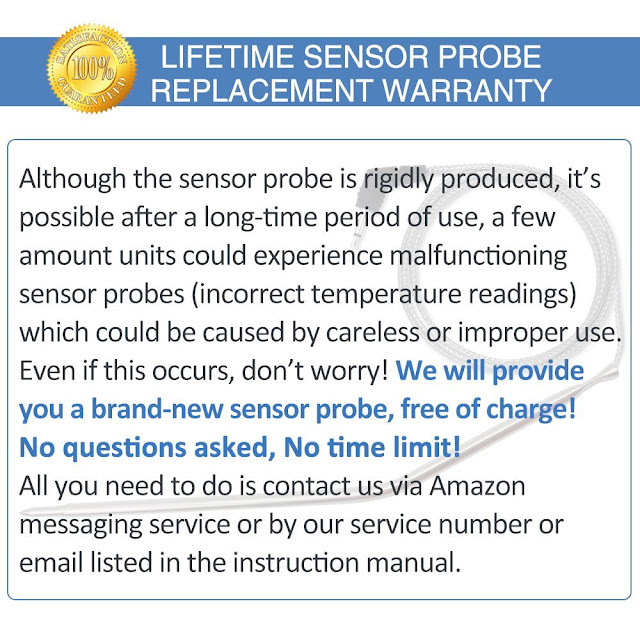 That’s why you will receive life-time sensor probe warranty with thermopro tp11 digital meat thermometer free of charge. NOTE: Make sure that you have received warranty card with your thermometer if not then contact to thermopro customer support immediately. Beside this keep warranty card safe for easy and fast claim processing. Product manual is one of the most important things many people don’t bother to read. In-fact reading product manual feels some users boring. Whether reading product manual feels you boring or not, it’s suggested to read at least once. Product manual not only provides us information about right use of product but also some important info to keep that product safe for a longer time. At least we should have to read the right way to keep our product for longer time and right use of the product. Beside this, if you have bought that product first time then it’s very handy to configure the product by reading manual. So, it’s highly recommended to not only read the product manual but also to keep the box contents at a safe place for future warranty claims and other related issues as well. In order to read detailed Manual of thermopro tp11 thermometer, please follow the link given below and scroll down to the page to find thermopro tp11 manual. Works over long distances – Monitors your food from 300 fett away. After few hours of working it will turn off automatically if not being used. You have to turn it on again wherever you have placed it. 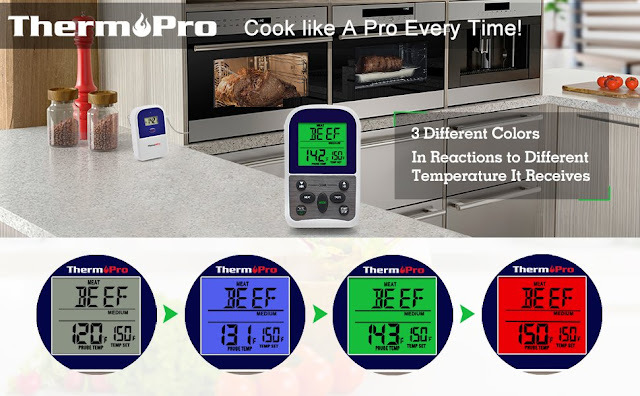 Thermopro TP11 is one of the best looking beautifully designed digital remote wireless meat food cooking thermometer. This thermometer has some messy setup and requires synchronization before it can be used. 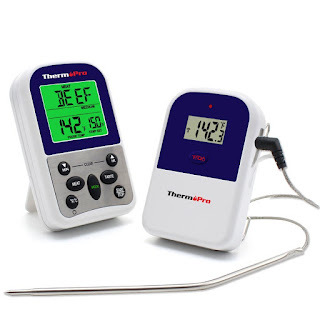 TP11 is also single probe thermometer meaning that you can’t monitor two types of cooking with this thermometer. If you are seeking for single probe already synchronized thermometer with same features as that of tp11 then thermopro tp07 is best alternative to tp11 meat thermometer. But if you are seeking for dual probe meat thermometer with some enhanced features and functionalities as that of tp11 then thermopro tp22, thermopro tp20, thermopro tp08 are best alternatives with dual probe functionality. Your feedback is very important for us to keep up our spirit and to publish more valuable information related to cooking thermometers. If you have any query, please feel free to ask as many times as you want. Please leave your feedback in the form of comment and also share this article with your family and friends. We need your support. THANKS!